Ford Taurus: is this a springlock connection? My daughter crunched the front of her 93 Taurus and I am replacing the condenser (and accumulator). The back of the accumulator has a bracket thing covering the spring connector, but the front of it has this connection (see picture below)- and it doesn't look like anything in the manual. But I probably just don't know what I am talking about! 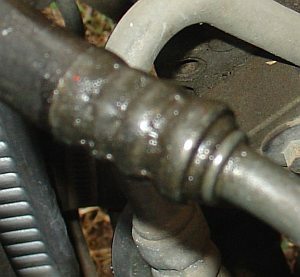 That is actually a picture of the condenser hose connection, but it is the same type. Is there a spring connector in there, somewhere? I have the spring tools, but I'm not sure where to start on this. ps the refrig all spewed out in the wreck, about a year ago. Am I reasonably safe just putting in a new accumulator with new oil in it, or do I need to find a vacuum somewhere? No thats where the AC hose is crimped to the metal line. That is a permanent connection. In some Fords the accumulator is replaced as an assembly with hoses crimped on. Sitting with a broken condenser for a year, you really should flush everything you don't replace. At an absolute minimum pull compressor and drain it. The remaining oil in the system will be heavily contaminated with water from moist air, there may even be actual liquid water in the lines. Well, neither the new accumulator or the new condenser came with hoses crimped on, so I guess I will have to figure out how to get new connectors on these hoses (not likely, huh?) or new hoses. Which means everything will be new except the compressor and evaporator. How do I clean out the evaporator? Solvent and compressed air? Sorry, I haven't looked these procedures up yet but I will. You have the wrong part then. This is what should fit your car. I ordered the parts before I had a chance to look closely at the car. Then, once they were ordered, and I was back in town and nosing around under the hood... That'll teach me! Thanks. I hope this helps someone else someday!